26th January is a historic day. For India, it marks the date when constitution of India came into force; for Rajasthan it was the date Palace on Wheels chugged off on its maiden voyage. Although the concept of luxury train traveling is quite old in the West, for the first time in the history of India, a state tourism board decided to woo tourists and promote tourism overseas through the concept of luxury train. Among the international tourist, who prefers an authentic experience while traveling abroad, Palace on Wheels is just the tailor-made option to explore the rich heritage and culture of Rajasthan, a state comprised of erstwhile princedoms ruled by Rajput warrior princes. These maharajas of the land - something akin to the landed gentry in the West - were known for their indulgence. Being filthy rich, they built mighty forts, lavish palaces and indulged in idiosyncrasies that are now stuffs of legends and folklore. Yet to their credit, they preserved and propagated art and cultural exchange. That to refer to them as the patrons of art would not be an overstatement. Various artists from all walks of life flocked to the patronage of these Rajput warrior princes, art and craft flourished; so much so that this otherwise barren state is one of the most vibrant and colorful destinations in India. No wonder we have included Rajasthan as one of the top places in India to visit in winter. Today visitors from all around the globe have Rajasthan as their first preference when they plan for an Indian holiday. For some it’s the riot of colors in turbans and the saris that the native wear set against the desert landscape and for some it’s the allure of lavish forts and palaces. Recently 6 hill forts of Rajasthan were inscribed by UNESCO as World Heritage Sites. 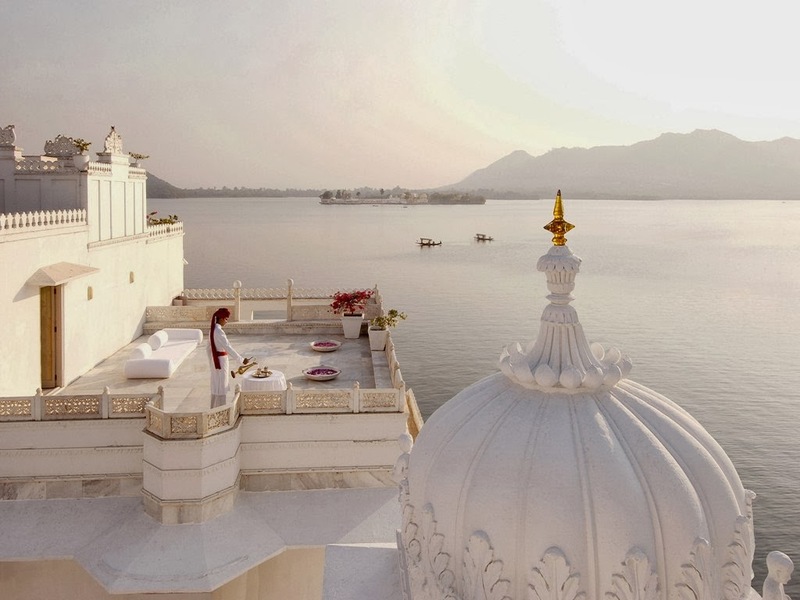 One of major draws of Rajasthan is the tastefully restored heritage hotels like Taj Lake Palace. These living legends which earlier belonged to various maharajas and their kin have now been converted into heritage hotels. For connoisseurs and corporate jet setters, heritage hotels in Rajasthan present an irresistible allure when it comes to choice of accommodation. Once the palatial rooms of these heritage hotels served the purpose of courts and durbars, inner palaces were private chambers and courtyards for entertainment of hosts as well as royal guests. Set amidst this background, stay in these heritage properties is a walk down the history lane - you might even wonder whether time travel is possible - to discover the pomp and legends of former princes, an authentic cultural and heritage experience in unmatched finesse. Gajner Palace in Bikaner and Devigarh Resort are two fine example of palace hotels in Rajasthan. Also check out 3 best heritage hotels in Jaipur and the 5 best palace hotels in Rajasthan. Then there is the variety of wildlife that could be observed in Ranthambore National Park, the former traditional hunting ground of Maharajas of Jaipur and Keoladeo National Park (which we had earlier listed as one of the top 10 awesome attractions of India), where the Maharaja of Bharatpur arranged duck shoots to honor and entertain British Viceroys of India. If interested in call of the jungle, you may also want to check out wildlife vacation ideas in India. Yet another activity that draws tourists is the shopping in Rajasthan. Paintings, jewelry, textiles, handicrafts and ethnic dressings, these and more are a rage among travelers from both India and overseas. To not mention the cultural fairs of Rajasthan would be a gross injustice to the allure of this desert state. Cultural festivals and events in Rajasthan are recognized around the world. Thousands travel to attend Pushkar Fair, one of the most popular festivals in Rajasthan. Besides, Jaisalmer Desert Festival is yet another crowd puller along with the Camel Festival of Bikaner. Not that these cultural events form the microcosm of Rajputana, but several fun activities, shopping and camel safaris in the sand dunes offer a multitude of cultural interactions that translates into unique and everlasting guest experiences. This and many more aspects of Rajasthan makes it one of the top 10 places to visit in India. It is said that traveling in Rajasthan could keep even the fussiest of travelers on their toes. The sensory attack, the profusion of colors, the clattering of carts and frolic of folk performances and the hubris of fiddling through the rich heritage is a grandiloquent task; it might as well leave you confounded. That is where Palace on Wheels steps in to your rescue. Composed originally of the private rail carriages used by Maharajas, Nizams and Viceroys of India, Palace on Wheels embarks every Wednesday from Delhi on a royal voyage spanning over the duration of 7 nights and 8 days. How does it account for the authentic stay in heritage hotel? The guest carriages of Palace on Wheels are designed to incorporate the elements of décor, history and culture of various princedoms of erstwhile Rajputana. Each carriage is named after a princely state. Sylvan furnishings, door to door carpeting, modern amenities in each cabin along with attached personal washroom, dining cars, bar and lounges are some of the distinctive features of the Palace on Wheels. Every moment spent on board the train is like spending time in a bygone era of elegant train traveling. A Khidmatgar (royal butler) is always at your service on board to take care of your every need. Dinners and lunch are on the house but guests need to pay for the spirits and liquor except for the house brands of wine and drinks. Off the train, all charges for transportation, entry fees, guides etc. are covered in the tariff itself. This is an important aspect of luxury train travel in India. Not just the movement during night and arrival at a new destination saves much precious time, the all inclusive itinerary ensures the absence of touts and fleeces which are the most irking part of normal travel in India. An array of forts and palaces are covered. Guests are also exposed to shopping experience which is an essential part of tour to Rajasthan. A total of 7 destinations/attractions inscribed by UNESCO as World Heritage Sites are covered during the week long itinerary of Palace on Wheels. Are these reasons enough to make it one of the top 10 luxury trains in the world? Palace on Wheels travels across more than 9 former princedoms of Rajputana and various themes like heritage, history, wildlife are covered in a way impossible through any other mode of travel. Special cultural performances are arranged at select destinations. All along the journeys and destinations, the royal treatment reminiscent of the ways of former kings of Rajputana is invariably invoked. And here are 5 things about Palace on Wheels if you are interested. And check out this video of Palace on Wheels journey for a peek into the royal rail journey through Rajasthan. You may plan your Palace on Wheels journey through the website of Indian Holiday Pvt. Ltd. (www.indianluxurytrains.com/journeys/palace-on-wheels), a Delhi based Destination Management Company with 2 National Tourism Awards and 23 years of service to vouch for its credibility.